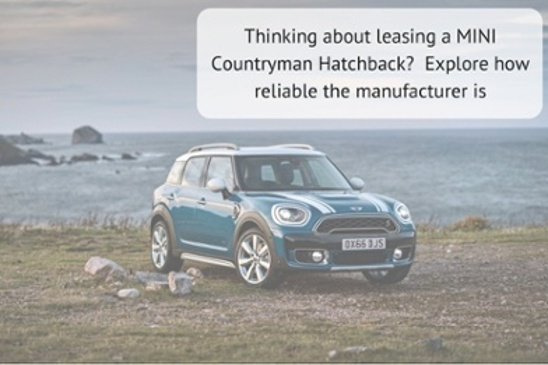 The brand new MINI Countryman Hatchback packs everything we know and love about a MINI into a compact and robust body style – good looks, a keen sense of fun, and economic engines. There is plenty of space, while a roomy boot is a huge bonus. As far as family cars go, they don’t come much more entertaining than this one. Although it’s never going to be held in high esteem by MINI purists who never thought they’d live to see such a useable MINI, it will strike a chord with buyers who love MINIs but who need something for all the family. OSV takes a closer look at what it’s all about with our 2017 MINI Countryman Hatchback review. 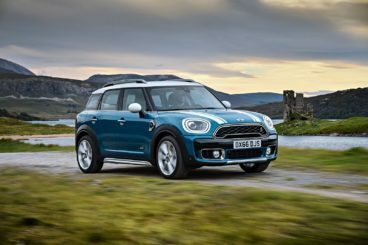 Out on the open road, the Countryman can’t claim to be as agile as a classically compact MINI. However, for it to appeal to MINI buyers, the Countryman had to be fairly nimble on its toes. It is. Whether you’re a keener driver or a more easygoing one, there should be enough here to suit both tastes. And despite being bigger than the average MINI, it sort-of shrinks around the drive once you get going. In other words, you really do feel as though you’re driving a smaller car. That said, it doesn’t have the quicksilver responses of a MINI Hatch, and you’re always aware of its extra weight. Dynamic Damper Control is an optional extra worth adding if you want to be able to alter the driving modes. You can boost or diminish the amount of power assistance, as well as alter the sensitivity of the accelerator. In terms of its engines, a pair of 2.0-litre diesel units are up for grabs. The smaller of the two produces up to 150bhp, and can do 0-62 in under 9.0 seconds. We reckon that will be enough for most buyers, although opting to add four-wheel-drive and an automatic transmission can boost that time to 8.7 seconds. The Cooper SD variant is powered by a 2.0-litre 190bhp diesel engine, and can do 0-62 in around 7.7 seconds with two-wheel-drive. Add four-wheel-drive, and you can knock that time down to 7.4 seconds. That’s nippy, and we’re impressed with the engine on the whole. It’s smooth, and only groans when you’re at higher revs. However, the Cooper SD model doesn’t come with the option of a manual transmission. Next up are the petrol engines, which begin with an entry-level 1.5-litre turbocharged unit. This develops 136bhp, and takes 9.6 seconds to complete the 0-62 dash. We prefer the bigger, four-pot 2.0-litre turbocharged unit that powers the Cooper S. It produces 189bhp, and does 0-62 in just 7.3 seconds. The John Cooper Works will be more eye-catching to keener drivers, however. It’s more expensive, but adds almost an extra 40bhp, and can do 0-62 in 6.5 seconds. Top speed is 145mph, which makes it the fastest MINI yet. It’s a wonderful model that overtakes with confidence, cruises superbly, and accelerates with power. Rounding off the range is a hybrid model that combines an electric motor with a 1.5-litre petrol engine to develop 221bhp. 0-62 is done away with in just 6.8 seconds, and you can reach speeds of 78mph on just electric power. From the outside, only the connoisseurs will grumble that the new Countryman doesn’t much look like a MINI. We reckon everyone else will be satisfied. Inside? We have a feeling you’ll all be satisfied. It’s a typical MINI affair. In terms of quality, though, it’s almost on par with Audi. The switch gear and controls are logically arranged, while the likes of LED ambient lighting can be added. The central dial will be reassuringly familiar to MINI buyers, and as ever features a round LED light ring that surrounds it. A 6.5” colour screen is standard on all models, but in a change-up, the speedometer is now mounted right in front of the driver. Our only real criticism with the cabin is that a few of the minor controls might be hard to get to grips with. Most people will be looking at this for its practicality levels. It’s definitely more usable than the standard MINI Hatchback. It has bigger dimensions, and more interior room for you and your passengers. Knee room and headroom are particularly awesome in the rear, while the back seats can easily be slid back and forth or even reclined. The doors open nice and wide for easy access, storage compartments are here, there and everywhere including a pair of cup holders next to the gear selector, and the boot measures 450-litres. That’s a 100-litre improvement over the last model. All in all, it’s a capable, versatile family car. Standard kit is good, with entry level models getting cruise control, Bluetooth, 16” alloys, as well as rear parking sensors. The Cooper S and SD models add 17” alloys and a lovely leather/cloth trim. The John Cooper Works model tops the range. It’s pricey, but you get a more aggressive exterior design, bigger 18” alloys and LED headlamps. Is the car safe? Five stars from Euro NCAP for its crash-test performance would certainly suggest so. Add to that a 90% score for adult occupation and 80% for child protection, and it’s evident that this is a robust, secure car. Moreover, we like that automatic emergency braking is standard on all models. Prices for the new car start out from £23,000 and rise to £33,145. For more information on our leasing deals, check out our page here. 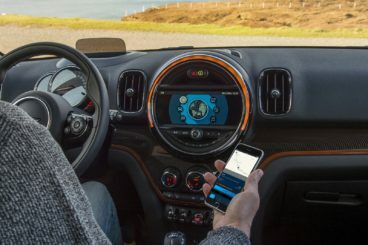 In terms of its running costs, MINI have as usual delivered the goods for buyers who don’t want to spend a small fortune at the filling station. The hybrid is easily the most affordable to run, and can even keep going on electric power alone for 25 miles, and averages 134mpg according to MINI. However, you would need to fork out £29,000 just to buy it in the first place. Assuming most buyers won’t want to be doing that, the 2.0-litre diesel is the cheapest conventional diesel engine to run. It returns 65.7mpg when paired up with a manual ‘box, and emits just 113g/km of CO2. The Cooper SD, meanwhile returns 61.4mpg, while the smallest petrol engine is good for a 51.4mpg economy. Opt for the rapid Cooper S, and you’ll be returning 44.1mpg at best. MINI’s have always been fun and carefree. But sometimes you need your car to be more than that. On the road, it’s more composed than ever. A big boot, plenty of interior space and lots of storage make this the most usable MINI yet. Its interior has come on loads over the years, and can now rival the likes of Audi for a premium feel. As we’ll find out later in this review, its entry-level model is £2,000 more expensive than the Audi Q2’s starting price. MINI has worked really hard to hold onto its unique face. However, the purists will argue they haven’t succeeded. Let’s see how the car fares against its rivals in the comparison section of our 2017 MINI Countryman review. 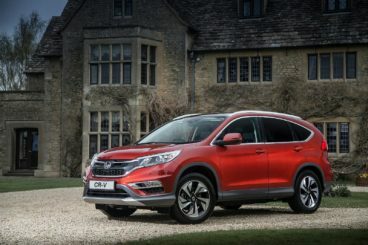 The new Honda CRV is an assertive-looking large family car that boasts one of the best reliability records for any mainstream model. It’s also packed with safety features, and has been built to last. Honda has clearly put this car together to be as practical and as usable as possible. As such, its on-the-road capabilities can’t quite match the MINI’s prowess. There is plenty of grip on offer, but the four-wheel-drive variant in particular feels lifeless and no fun. Moreover, it leans a lot in corners. The two-wheel-drive variant fares a bit better, and feels more agile and nimble. Both models are soft and comfortable enough with the standard alloys, but adding bigger ones will increase firmness and road noise. There are three engines on offer. Our favourite is a 1.6-litre diesel engine that develops 118bhp and does 0-62 in 11.2 seconds. It’s a fairly quiet engine (for a diesel in a small SUV) and offers good economy and decent progress. There is a more powerful version of the same engine. But while it has a faster 0-62 time of 9.6 seconds, its sharp increase in fuel economy will rule it out for some buyers. A solitary 2.0-litre petrol engine rounds off the range. It’s smooth, quiet and takes just 10.0 seconds to complete the 0-62 dash, but it gets hammered by fuel economy, and this makes it harder to recommend. Are we exaggerating? Well, it can’t even return 40mpg. Worse still, it will cost £500 to tax for the first year. The smallest 1.6-litre diesel engine, meanwhile, can return 64.2mpg, and costs just £160 in road tax for the first year. Inside, Honda has very much focused themselves on making this a strongly-built, durable cabin. But while it can cope with pretty much anything you and your family can throw at it, there are lots of cheap plastics and dated materials inside. Compared to the MINI, it doesn’t feel as classy or as modern. That said, comfort is supreme, and the interior is super quiet. Visibility is also fantastic, thanks to the raised ride height. It’s also a really practical car. Five people can sit inside here comfortably, with rear legroom particularly awesome. There is no awkward transmission tunnel, which means even the middle seated passenger won’t be complaining. Headroom is good too, and even taller passengers shouldn’t be grumping on longer journeys. The boot, meanwhile, measures 589-litres, which is well over a hundred litres bigger than the MINI. The new Audi Q2 might feel like it belongs to an altogether different category to the MINI, but the MINI Countryman has caught it up in terms of premium and upmarket feel. 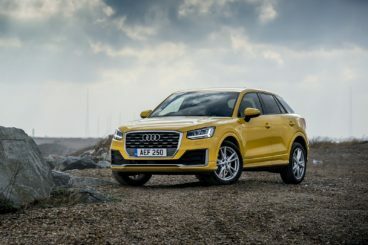 Moreover, prices for the Audi Q2 start out from just £21,400. That’s even cheaper than the entry-level MINI. How things have changed! It’s a bigger, bolder and more purposeful version of the Q1. On the road, it drives a lot more like a Hatchback than the SUV it’s marketed as, which means minimal body lean in bends and responsive steering. You can firm or soften up the suspension using Drive Select, while Quattro four-wheel-drive is available with select models. In terms of the engines, a 1.4-litre TFSI petrol engine is our pick. It moves swiftly, and can get you from rest to 62mph in just 8.5 seconds. It’s noisy, but it’s a pleasant noise, and we like its smooth and quick-to-respond automatic gearbox. Meanwhile, a 2.0-litre petrol engine tops the range. But while four-wheel-drive is standard, we think it will be too expensive to buy and run for most buyers reading this review. The diesels are ideal for high-mileage drivers. They’re not quite as smooth as the petrols, but both the 1.6-litre and 2.0-litre diesel engines have already proven their worth in other Volkswagen’s. The engines on the whole are fairly affordable to run. Our favourite, the 1.4-litre TFSI petrol engine returns 51.4mpg, an impressive figure that’s made possible by the introduction of cylinder-on-demand tech. The 1.6-litre diesel engine, though, can return as much as 64.2mpg economy, and emits just 114g/km of CO2. As ever with an Audi, the Q2 boasts a luxurious cabin that’s personalised, simply but elegantly designed, and flowing with top-class materials. There is evidence of lower-rent plastics here and there, but the Q2 can’t be beaten for a tasteful and welcoming atmosphere. Each model comes with a 7” infotainment screen, too. It’s based on the Audi A3, which guarantees good practicality. The cabin is roomy, the doors open nice and wide for easy access, while the high roofline means headroom is good. The driving position is perfect, and the boot measures 405-litres. That’s smaller than the MINI, but its square shape will prove useful. With a large boot, a typically fun-loving driving experience and the usual MINI charm, this new large hatchback is an exciting proposition. The only real deal breaker we see is its high-listing price. If you can get beyond that, the brand new MINI Countryman is ready to be your new, super dependable best friend.